I’m excited to share that RedeemedVintage.com now has an online shop open for business. Please have a look around, check it out. I would love to have your feedback! I ship smalls all over the US. All of the items are also available for pick up if you are local in the Chicagoland area. I have several hundred pieces not yet listed so if you are looking for something in particular let me know. I’m also open by appointment whenever I’m in town, don’t be shy…I have visitors coming to shop daily. Here are a few images in the showroom. Pair of three (3) drawer dressers side by side topped with Antique and Vintage goodies. Beautiful Drexel 5 Drawer Dresser painted in ASCP Duck Egg Blue with a white wax finish and stained top. Sweet Vintage four drawer chest, white with square gold pulls. Are you seeing anything that you would like to have a closer look at? Matching Thomasville French side tables. Vintage four (4) drawer chest ASCP Olive with stained top and awesome brass hardware. from amazing markets in London and from my friends in England. Amazing London Markets Finding Treasures for you. 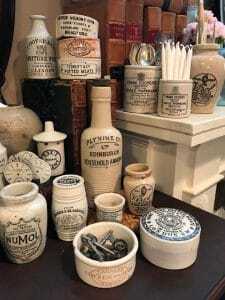 Posted in Antique English Advertising pots, Online shop and tagged Antique English Advertising crocks, Apothecary, Frank cooper marmalade, James keiller. Carole, Love your shop. I love it all, you have wonderful taste. Hope to see you soon. So happy to have found this shop! Seriously, my new favorite!! I absolutely love everything! Exceptional quality, fast shipping, excellent packaging. Thank you for the time you put into it. Will definitely be ordering from you again! I am so please and impressed!